COME AND DANCE, WICKED WITCH! Welcome to a community party deep in the woods. A hare shares his plans for a nighttime woodland dance with his two good friends, an owl and a hedgehog. It won’t be any ordinary party but one in which everyone will bring something, either food or music, and everyone will be invited, “even the wicked witch.” But she is not in a good mood, is too busy anyway, and says no. Being a witch, she is standing over her pot cooking up a potion even as musical notes enter her kitchen. The potion, alas, goes awry, and the witch blames the outside noise. Bent on revenge, she flies to the scene of the party only to be warmly greeted by the hare. Invited to dance, she is soon swept up in steps of joyous abandon. 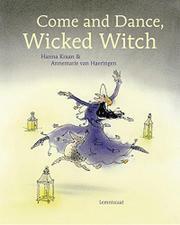 This import from the Netherlands is a literary, rather lengthy tale that can be read by adults as lessons in community and the power of music to bring joy into the hearts of even the wicked. For children, it is an inviting tale of animals sharing good times with friends and with the neighborhood baddie. Delicate pen-and-ink–and-watercolor illustrations with softly hued backgrounds of orange, pink, green, and gray effectively convey the congenial setting, personable partygoers, and free-spirited movement.